Carroll Baker. Lee J Cobb. Henry Fonda. Carolyn Jones. Karl Malden. Gregory Peck. George Peppard. Debbie Reynolds. James Stewart. Eli Wallach. John Wayne. Richard Widmark. Harry Morgan. Robert Preston. George Marshall. Richard Thorpe. John Ford. Henry Hathaway. Drama. Classics. Family Viewing. Western. Romance. 19th Century. Sea/Rivers/Boats/etc. Robberies Burglaries Heists. War. Trains. Historical. Recommended. 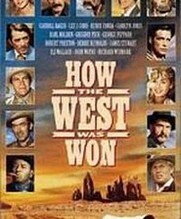 Shot in five sections "How The West Was Won" is a sprawling multi-star epic following the fortunes of one family from 1839 and New York to 1889 and Arizona. 'The Rivers' (dir Henry Hathaway); the Prescotts head west down the Ohio river. 'The Plains' (dir Henry Hathaway); Lily moves to St Louis and on to Caifornia. 'The Civil War' (dir John Ford); Linus and Zeb enlist on the Union side. 'The Railroad' (dir George Marshall); the settlers multiply and cavalry officer Zeb finds himself in a war with the Arapaho Amerindians. 'The Outlaws' (dir Hathaway); Lily leaves San Francisco for Arizona where Zeb has to deal with Gant. A final coda shows a 1960s Los Angeles and how it has changed since the 1880s.